I have not done a Table Top Review for the Blackwater BW1911 R2 Blowback BB Pistol but I have done a full Table Top and Field Test review for the KWC M1911 Model 1911 Tac A1 which is essentially the exact same gun as the Blackwater BW1911 R2 but without the silver highlights and Blackwater licensing. I did want to take the Blackwater BW1911 R2 back a bit further than usual and shoot it from 30 feet out to see what kind of results I would get and got pretty close to a two inch group that was well centered but just a bit under the bulls eye. This is not going to be the hottest gun in terms of fps as my Chronograph confirmed for us coming in at just a bit over 300 fps. 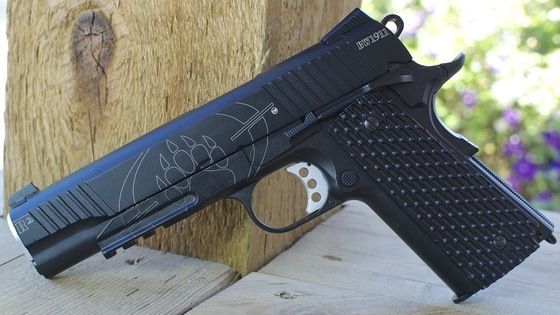 I can see this BB pistol hitting the claimed 320 fps and even faster on a hotter test day. 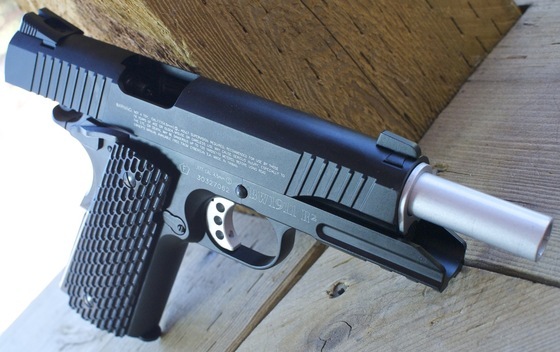 I did have one hiccup during my testing when the heavy blowback in combination with my high thumb position, knocked the safety into the safe position, other than that this CO2 Blowback BB Pistol performed very well for me and like the other KWC/Cybergun 1911's was a total joy to shoot.